Yes, here I go again… reminiscing. This time I have a few thoughts on sewing, that waning art and craft. Now, sewing is a fairly general term. What I want to comment on is not hand sewing, which includes fancy stitching and quilting. (Actually, Bartlett’s lists 21 types of sewing.) I want to talk about the most practical form, sewing garments by machine. Let me begin in the days of old, when girls were sweet and boys were bold… No, no; I’m getting off track here. I mean the middle of the 20th Century when girls were still encouraged to master patience and quiet resolve under the watchful eyes of moms who were, very often, models of patience and parsimony. The elder seamstress in our family was my maternal grandmother, Effie. She’d been taught hand-sewing by her mother, a seamstress; thousands-and-thousands of fine, even, nearly-invisible dashes of thread through fabric – and Effie was not fond of the work. As a wife and mother of four, my grandmother acquired a treadle sewing machine. The picture above is of a machine similar to my grandmother’s – with a fine, varnished wood case, fancy wrought-iron treadle and shiny, black machine trimmed lavishly with gold-leaf designs. A magnificent furnishing for the parlor and an essential tool for the homemaker. The invention of the family sewing machine was tied to supply and demand. Wildly productive weaving mills produced vast quantities of fabric. Markets were needed to absorb the supply. Huge, industrial sewing machines turned out serviceable garments that dressed the nation. But some entrepreneurs saw a significant, untapped market – the homemaker. Until the 20th Century, homemakers hand-stitched trousers and skirts, blouses and shirts for everyday use. Such painstakingly produced garments were not tossed aside blithely. They were used and passed-down through families. Unless you were quite wealthy, only special occasions warranted the purchase of a garment from the Sears catalog or the dry goods store. Easier production of family clothing might mean more family clothing – and it did. In her book about the history of the sewing machine, Grace Rogers Cooper recounts the work of inventor-machinists Nathaniel Wheeler and A.B. Wilson. They devised a small sewing machine that could produce single garments. Then, around 1870, Isaac Singer envisioned how to market that little sewing machine as a “family machine.” Women were savvy early-adopters, why not an easy way to clothe their families? American homemakers were embracing washing machines, ice boxes and gas lights, work-reducing,inexpensive, modern conveniences. Here was one more practical investment for the family, a sewing machine. Singer tapped into this enthusiasm for work-saving machines. By 1905, the “Singer” was in great demand. His treadle sewing machine was a moderately priced, reliable workhorse, outfitted in discreetly splendid attire. What homemaker could resist? Making doll’s clothes taught me how the elements of a pattern worked – the darts for fitting, the seams and hems, the necklines and sleeves. All these components have their tricks, the way they must be joined with the other parts of the garments if the dress or jacket is to fit the doll. On her sewing machine Mom turned out dresses, jackets and suits for herself and her daughters, and even shirts for our dad. Mom had a seamstress’s eye for the right fabric, the best pattern, and how to “fix” garments when they began to wear. She taught me how to look at a picture in a catalog and figure out what fabric I could buy and what pattern I should choose to create my dream dress. At the fabric store we poured over the Butterick and McCalls pattern books. With each project Mom taught me a new skill. I learned the complexities of French seams, pleating, matching fabric patterns, covered buttons, tailored button-holes, reversible garments. I learned to sew on silk and nylon, terry cloth, corduroy and velvet – all very tricky fabrics that required just the right touch if one wants smooth seams and graceful draping. For me, the ultimate test of my handiwork was if no one asked me, “Did you make that yourself?” That question was the “kiss of death”. Recently, I’ve surveyed friends of my generation, and women a decade or two younger. Many of them learned to sew as I did. Friends from working class and middle class families learned the practical skills associated with the sewing machine. Friends raised in more affluent homes bought sweater sets and pleated skirts at the shops downtown. We all learned the lady’s accomplishment, decorative stitchery – embroidery, crocheting and knitting, no matter what our social standing. I wonder if sewing machines might regain their prominence in the homes of working families? (I still have one that I use for mending and making slipcovers.) As families choose, or circumstances force them to make do with less, a stay-at-home parent might reintroduce sewing as a skill worth mastering. If we have more time and less money, there may be an expanding interest in not only gardening and crafts but in the do-it-yourself of fashion – sewing your own clothes. A small but dedicated segment of women continue to sew cloths, curtains, slipcovers and Halloween costumes. Will their numbers grow? Rosie Grier and Martha Stewart, here’s your next new thing! 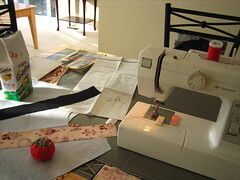 This entry was posted in Life Lessons and tagged Isaac Singer, McCalls, Nathaniel Wheeler, Sewing, Sewing machine, Textile. Bookmark the permalink. Hi Jan! Loved your article? I have forgotten the clothes I bought when growing up, but I remember clearly the sweet dresses my mother made for me, especially the pretty lavender one for my 8th grade graduation. We had a room in our home for the sewing machine by the window and a freezer where we froze the strawberries and food from our mini farm on our acre of land. My parents built the 3 bedroom plus sewing room – 1 bath home with their bare hands. I can still see my mom on top of the roof hammering away when I was a toddler. So, I grew up in a brand new little house they built. We never had a repair bill in our home or autos because my dad could fix anything! He built the boat we took to the lake too and learned how to water ski. My parents made most everything we needed and were truly self sufficient. Thanks for the flashback of those loving memories that started with my mom’s sewing!